Code development version. This document provides some assignment solution ideas, presented here as an exercise. B.2 Write a private sub procedure to test the P2R function. 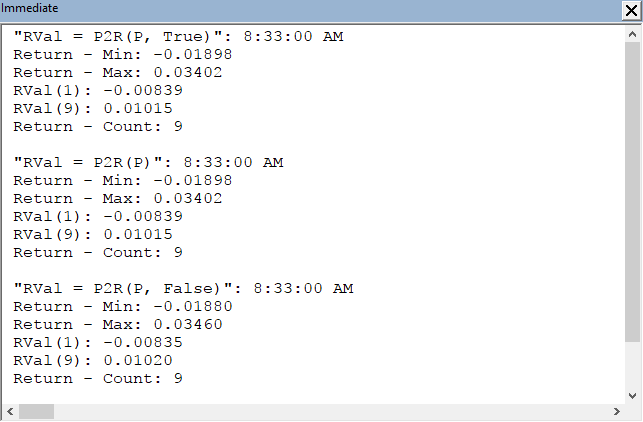 Pass the Close vector of the data test period to the function, and set the Optional argument to the default value. The test procedure writes the minimum, maximum and count statistics to the Immediate Window. B.4 Write a User Defined Function procedure named ArrDim to return the number of rows in a column vector. The function has one compulsory argument, named Arr of suitable type. The return value should accommodate the maximum row dimension of a worksheet. This is a code development version - that describes a series of tasks with suggested coding solutions. Note: "The "Close vector of the data test period" (from point B.2) is set to 10 observations in this version. Line 6: function procedure declaration - Private function with 1. Compulsory argument, a VBA array (dynamic) named Price. 2. Optional argument named Ret as Variant with assigned default value equals True. Column P: Construct the individual P elements using concatenation P6: ="P(" & ROW()-4 & ")"
Write a private sub procedure to test the P2R function. Pass the Close vector of the data test period to the function, and set the Optional argument to the default value. The test procedure writes the minimum, maximum and count statistics to the Immediate Window. 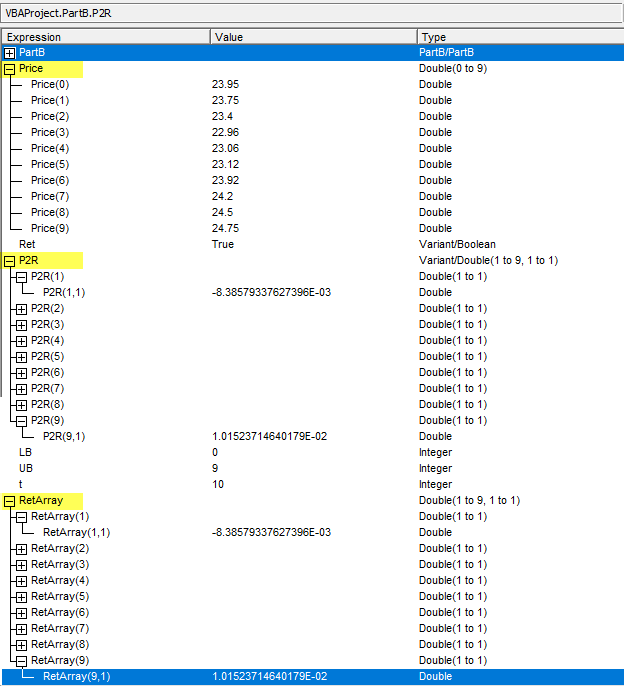 Const dPlaces As String = "0.00000"
In addition, the ArrDim function can also be used in the Price2Return procedure. An ascending order price vector is passed to P2R and the return vector is then oriented to match the direction of the original price vector. In code 3, the Price2Return function is a "wrapper" for the P2R function. This means that P2R is called by Price2Return. The function can be tested from the TestPrice2Return procedure in code 5. Write a User Defined Function procedure named ArrDim to return the number of rows in a column vector. The function has one compulsory argument, named Arr of suitable type. The return value should accommodate the maximum row dimension of a worksheet. As stated in section 1, this module is a code development version, so a number of points are available for discussion. Code 1 line 2 includes the declaration Option Base 1 to set the default lower bound of arrays in the module, but array declarations at lines 19, 47, 129, and 130 explicitly include the lower and upper index number with the To keyword. Is Option Base 1 required? RValue is declared with a column range "1 To 1", why not simply use "1"? Q2: Code 5 - ascending and descending? Code 5 you have two separate ranges - one for Price descending and one for Price ascending - what is the point of this. 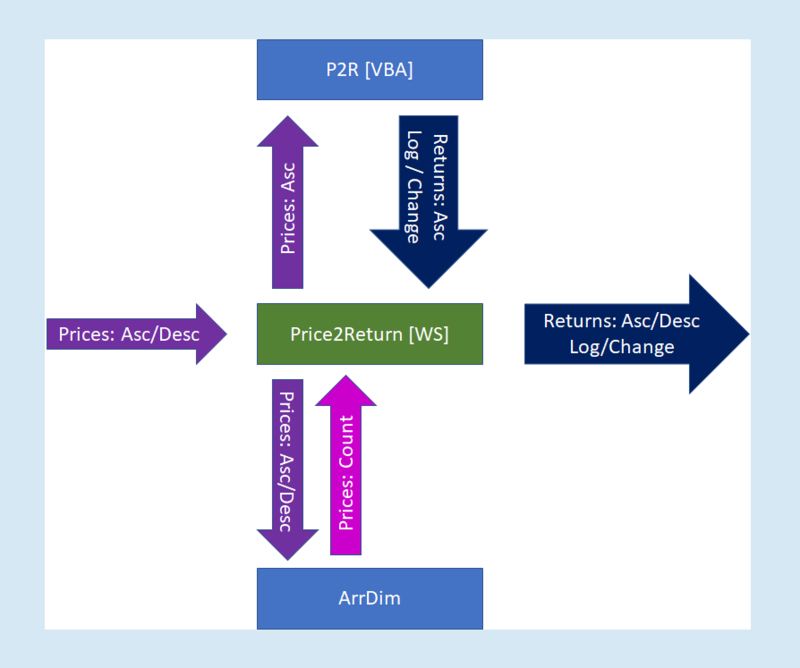 Isn't the Price2Return function in code 3 designed to intrinsically sort returns into ascending or descending from a single column vector range of prices (with direction set by Asc argument)? Yes - the direction can be switched by the Asc argument, but does it give the correct answer?